Not to engage in hyperbole, but the first thing a pregnant vegan should do after getting that plus sign on a stick is dash out and purchase the Vegan Pregnancy Survival Guide. Authored by Bonzai Aphrodite’s Sayward Rebhal and published by the fine folks at Herbivore Clothing (who provided me with a review copy), this guide serves up the ultimate in vegan girlfriendish guidance, especially if your girlfriends tend to be intelligent, funny, thoughtful, curious and thorough. 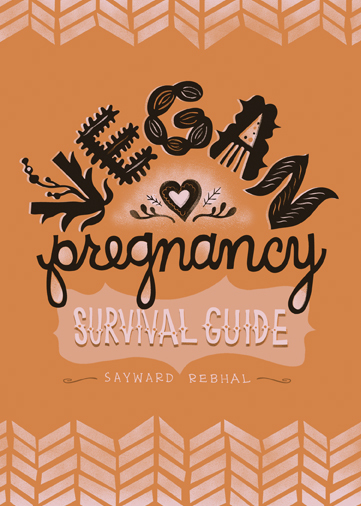 Sayward Rebhal is all of these things, and these attributes, combined with her firmly friendly writing style, mesh very well in this pocket guide to vegan pregnancy. She manages to be supportive and enthusiastic without veering into cloying or cooler-than-thou. Expectant and pre-expectant parents shouldn’t be fooled by the relative slimness of the volume. No, this is not a massive tome breaking down your intra-uterine changes week by week, but it is packed with information about the most topical issues surrounding a vegan pregnancy and the post-partum period. There are lots of nutrition tips and suggestions from broad “try these ideas” to specific advice about handling situations with both supportive and not so supportive folks (including medical personnel). I’ve read a lot of pregnancy guides in my time and though I’m not currently expecting any stork stopovers, I really enjoyed the fact that (of course) all of the snack and meal suggestions were vegan. It can be a bit tiresome to continuously filter out the suggestions in other pregnancy books that don’t apply to you (“have a scrambled egg! eat some fish, but not too much!”) when you are pregnant and therefore often already tired. All of these tips and suggestions do apply to you! It’s so handy and nice! Another aspect of this book to be appreciated is that the remedies to various commonly experienced pregnancy symptoms are assessed from a vegan point of view. Not only are the mainstream, typical treatments assessed for their veganness, if they are found not to be vegan, mother reader is provided with vegan options. For example, preparation H is not vegan (I didn’t know!). Rebhal has no problem providing honest descriptions about some of the ins and outs of pregnancy and baby-related changes. From nutrition to nursing to placentophagy to social encounters and much more, this great guide will serve as a treasured resource and oasis for pregnant vegans and their families. I wish this book had been around when I was pregnant with my kiddo 6-1/2 years ago! So glad this book is out there. I enjoy her blog and while I don’t plan on having any more children, I will be sure to check out this book and recommend it to veg friends.